← Real Madrid 1-1 Manchester United – An improved United shape gives them a slight edge heading back to Manchester. Milan 2-0 Barcelona – Clinical Milan put on a clinic. Max Allegri sprung no surprises in his starting XI as Stephen El Shaarawy returned from a knee injury and was preferred to M’Baye Niang. The positioning of Kevin Prince-Boateng was the biggest talking point heading into the game and he operated on the right handside. Jordi Roura picked an XI everyone expected for the visitors, after Xavi was pronounced fit, with only David Villa unavailable for selection. This was an absolutely fantastic performance from Milan. To understand why they were able to accomplish what they did in the second half you need to have witnessed the foundation they laid down in the first. The first 45 minutes was a clinic from a team playing Barcelona. In Kevin-Prince Boateng & Stephen El Shaaraway, Allegri had two players who were a threat when they had the ball but, more importantly, were defensively disciplined without it. In effect, they played as wing backs, allowing the back four to squeeze together in a narrow line up against a centrally focused opponent. The longer the first half went, the more the likes of Andres Iniesta and Cesc Fabregas stayed central. The centre-backs were terrific not sitting too deep, to allow space in between the lines, and maintaining concentration when not even having a specific man to mark in a forward position. Watching Milan defend as well as they did is nothing new but what is new is this Milan and that makes it even more impressive. With the likes of Alessandro Nesta, Thiago Silva, Clarence Seedorf and Zlatan Ibrahimovic in their side last season they caused Barcelona many in-game problems throughout their four encounters but many of those issues were forgotten by most when looking at the scorelines of 2-2, 2-3, 0-0 & 3-1. Having changed personnel and gotten rid of the experience they had, just makes this Milan result even more impressive. Aside from their transfers, the two biggest differences on this night, from last season, was how clinical Milan were with their finishing and how poor Barcelona were in stepping up the tempo. For all of their possession in the first half, there was a lack of speed in their pass, something that remained even when they went behind. The goal that opened the scoring had some controversy on it but to focus on that would neglect the reason for it happening in the first place. Victor Valdes had an uncharacteristic long clearance up field and it was poor, allowing El Shaaraway to pounce and press immediately. Dani Alves then had to track back and again showed he isn’t great at defending when running towards his own goal, as he committed a silly foul on El Shaaraway. From the ensuing free kick, the ball hit Cristian Zapata’s hand but he had hardly any time to get out of the way before Boateng unleashed a wonderful strike past Valdes. Barcelona’s issues remained at 1-0 until they removed the ineffective Fabregas for Alexis Sanchez. The former Arsenal man just never got any space to operate in against a disciplined backline and Sanchez was needed to provide vertical runs across the defence. His inclusion made a small difference but the visitors still rarely posed a threat to Christian Abbiati in the Milan goal. The second goal, ten minutes from time, came via the same route as the first. 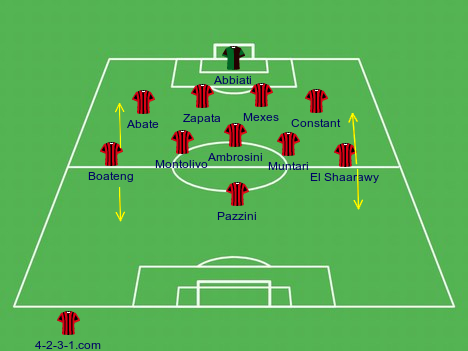 From a throw-in by Jordi Alba, Milan’s midfield pressed immediately as the exceptional Massimo Ambrosini and Boateng closed down the Spaniard and then sent substitute M’Baye Niang into a flank vacated (once again) by an advancing full back. El Shaarawy (yes, he was everywhere) then lobbed the ball over to Sulley Muntari whose sweet left foot strike made it 2-0. It was a great, clinical goal and one that exposed Barcelona’s fragile defence. At the time, despite not playing well, they were only down by a goal but were far too open in the build up to the goal. The San Siro erupted into a party and in the middle of it was Mario Balotelli who, like many in Milan this evening, will surely enjoy this night as they should. Allegri’s system was exceptional but it was a night for his players who put the plan in place what he drew up. The back four did exactly what they needed to do from minute one to ninety, Ambrosini and Riccardo Montolivo were brace, intelligent and disciplined in midfield and the wide men countered as brilliantly as they defended. All-in-all it was the perfect game to play against Barcelona and Milan now head to the second leg on March 12th as favourites. Between then and now expect the home team’s brilliance to be talked up but for them to now progress they will have to produce something very special and this Milan side will have to be nothing like the one on show in this game. We must not forget Barcelona’s only conquerors in the last four years of this competition won their first leg against the Catalan giants (Inter Milan & Chelsea). AC Milan ended a seven CL match winless streak against Barca. This was their longest winless streak against any given opponent. Their longest winless streak against specific opponents now is three (against Galatasaray, Real Madrid and FC Porto). Kevin-Prince Boateng scored his fourth CL goal. Mickael Essien is the only Ghanaian player to have scored more CL goals: 11. André Ayew is also on four. Sulley Muntari scored in his CL debut match for AC Milan. The last Milan player to score in his first CL match for the team was Zlatan Ibrahimovic, who scored two in his first CL match for Milan in September 2010. The last time Barcelona lost a CL match by a two goal margin or more was also in Milan: away at Internazionale in April 2010 (3-1). FC Barcelona fielded nine Spanish players in the CL knock out phase for the first time in their club history. Only Real Madrid have ever started more Spaniards in a Champions League KO match (10 against Juventus in March 1996). Xavi played his 126th CL match, overtaking Clarence Seedorf (125) into fourth place of most appearance makers. Nice post as always KJ (getting tired of repeating myself). A lot of the pundits made too much about Pique being pushed up forward …but I wanted to know what you think will be Milan`s approach at the Nou Camp, given that it`s a very wide pitch? Nice post as always KJ (getting tired of repeating myself). A lot of the pundits made too much about Pique being pushed up forward …but I wanted to know what you think will be Milan`s approach at the Nou Camp, given that it`s a very wide pitch to play compact? Both pitches are the same size – 115 X 74 yds. UEFA standardized CL pitch sizes a few years ago, didn’t they? I believe Champs league pitches are standardized. 115 x 74 or so. I think that is the only way they will be able to succeed – attempt to duplicate what happened on this game. It will be a big task but that’s what Chelsea & Inter did at Barca when they knocked them out. Thanks for the comment.